Have you wanted to be more intentional about how you pursue business? 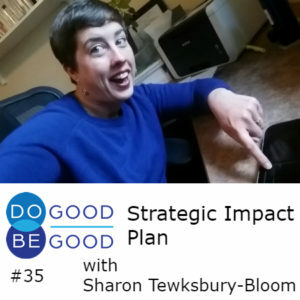 Do Good, Be Good owner and host, Sharon Tewksbury-Bloom, describes how she is developing a Strategic Impact Plan for her business. The plan includes a mission, principles, and best practices. Margaret Wheatley – Who Do We Choose to Be? Previous Post: « Is Your Team Stuck in a Decision Loop?